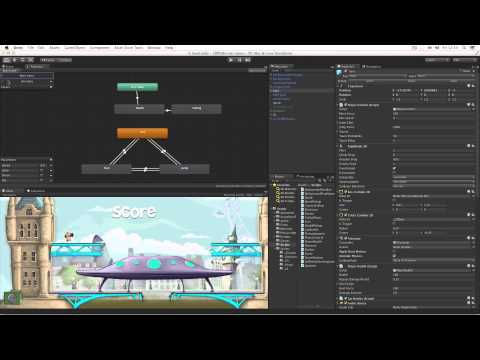 This longer lesson video gives an overview of the new 2D workflows introduced in Unity 4.3. It outlines the approach taken to produce the Tower Bridge Defense demo. In Unity 4.3 we're launching our first set of 2D features. demo project with these tools. understand how 2D games are put together in Unity. of working in 2D in Unity. Edit - Project Settings - Editor from the top menu. Scene View will default to 2D mode. view in which to construct 2D games. existing Unity approaches to 3D game creation. or vice versa you can do that with no worries. and how we built it up one stage at a time. recreating the layout in Photoshop. using the new Sprite type. and placed them on to a Background Sorting Layer. Yet another new feature of 2D development in Unity. of the Sprite Renderer to sort them. top right of the interface. on the sprite game object. fully commented in the Scripts folder. that our characters would actually traverse. to navigate around the level. a collider for characters to walk upon. but the UFO itself has a more complex shape. based on the shape of the sprite. above the backgrounds in the Tags And Layers manager. Next, let's take a look at our hero. 2D hits such as Rayman. which we'll discuss later in the video. as separate sprites in the Importer. our sprites as separate elements to be animated. transform to sort their rendering depth. controls scripting, colliders, physics, excetera attached to it. by animating each of the character's sprites over time. this is easier than ever. and then create keyframes for any of the child objects. to automatically keyframe the animation. ever to adjust timing and design. to cover the rest of his body outline. and when he jumps his head will hit the ceiling. we wrote a script that moves him via 2D physics forces. we check for player input. input in to the Speed parameter of our animator. that the Speed parameter is above 0.1.
in to the Run state. in order to move him around. checking whether it is above or below 0.
returns a value of -1, where right returns positive 1.
giving him the appearance of facing the opposite direction. and applied it to all of our walkable foreground surfaces. is below the character's feet. at which to check for the ground. the character we'll check for the ground. the character can only jump when grounded. information on the control of the player. tracks the player in our demo. the camera tracks back toward the player. but more of a stage on which the action takes place. similar tracking vertically as it does horizontally. on how it achieves this effect. to slay the alien onslaught he's faced with. Our hero shoots a bazooka which has animated recoil. This action is made up of several parts. play an audio clip and trigger an animation state to play. Let's break this down even further. by clips on the shooting layer. parameter is called from code. Let's take a look at the Gun script in charge of this. and set that trigger to True. which is perfect for actions such as shooting. that's positive or negative in the X axis. where the rockets are created. point at which to spawn the rockets. plus a particle system for smoke. sprites for the particle emission. that animates through a sprite sheet that we have created. at the lowest layer order of our foreground objects. and choosing the Sprite Mode Multiple. which allows us to slice manually or automatically. to be used in our project. So that's our rocket in a nutshell. later in this video in the section about enemies. how we handle health and taking damage. we call the TakeDamage function. to avoid the player being killed very quickly. by adding a physics force. we of course subtract from the player's health. and update the player's health bar. of the full health amount. the two separate elements were exported. so that when it scales down it shrinks towards the left. on it which makes it follow the player. for adjustment in the Inspector. one we've made to render in front of everything in the game. We have 2 animations for when the player dies. as our transition condition in the animator. we disable the PlayerControl and Gun scripts. falls in to the water. comprises of a trigger collider and a script. and then reloads the level. the other a med kit to boost health. These crate drops are made up of 2 parts. The crate itself and a parachute. to allow us to animate them as a group. centre is at the centre of the parent. as if the entire parachuting crate is floating to the ground. the player picks up the crate. animation state which scales the parachute down. the states of the object. when the trigger Land is set to true. which detects the ground via a tag. resting realistically on a slope if it lands on one. Let's focus on the bomb first of all. BombPickup script, attached to the crate. before calling the Explode function. The Explode function performs several actions. enemies within a defined blast radian. Let's take a look at how this last part works. tagged Enemy within a certain radius of the bomb. a force in the direction of that vector. and of course destroy the bomb itself. The visual of the explosion is twofold. to move the system to the desired position and play it. and makes the game more efficient. as the player can only throw 1 bomb at a time. efficient than creating instances and then removing them. need to spawn and remove them. kills an enemy and scores points. a 1 and a 0.
remove them from the scene when the animation is complete. at the end of the timeline. the score for the player. and add 100 points to the value. at them more in depth now. these as public variables in the Inspector. Each enemy has it's own Walk animation. ship-based enemy rocks back and forth as it approaches. and avoid having to scale the entire sprite. so that we could animate it over the top. and just meant that we rotated it back and forth. we drive them by setting the velocity of the rigidbody. which checks for a point in space overlapping a collider. sending them moving in a different direction. the particular enemy that it's hit. hit points of the particular enemy. inside the fixed update function. If it drops to 0 we call the Death function. When they die we perform a number of functions. number of sprite objects that are animated. by adding torque to spin them as they die. and set their IsTrigger parameter to true. an instance of the Score animation we showed you earlier. will cause a splash animation and remove that object. object we hear the sound right away. in order to make our game environment feel more dynamic. scene to let Unity animate them for us. As with the bus and the cab, the swan is saved as a prefab. and made a simple bobbing animation. which is in charge of spawning them. and where on screen to spawn them. with the same script on. and what properties to give it. Take a look at the comments in the script to learn more. we added rolling clouds, panning river details and fog. pan them across the screen. And that's how we made our game. that you'll come up with.